A return daytrip traversing the high altitude Newnes Plateau to Wollemi National Park and the Glow Worm Tunnel. 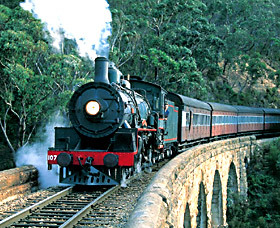 Follows part of the alignment of the old Newnes railway. Watch out for kangaroos, other wildlife and logging trucks. Slow down on narrow sections and beware of oncoming traffic on bends. From State Mine Heritage Park on the north side of Lithgow, this discovery trail climbs up the State Mine Gully Road onto Newnes Plateau where it joins the Glow Worm Tunnel Road. The Glow Worm Tunnel Road passes through extensive areas of pine plantation with many cross-roads, before entering native eucalypt forest. The road then enters national park (Gardens of Stone on the left, Wollemi on the right) and follows parts of the abandoned Newnes railway alignment past the junction of the Old Coach Road to 'No. 1 Tunnel'. Drive through the tunnel and around a sweeping bend to the road end and carpark. From the carpark you can walk one kilometre along the old railway through a ferny gorge to the Glow Worm Tunnel. Lyre-birds are often seen here. The 400 metre 'No. 2 Tunnel' curves to create a dark zone where star-like glow-worms (the larvae of a fungus gnat) hang their webs from the dripping walls. A torch is needed. An alternative walk to the tunnel is via the Pagoda Track, which starts from the carpark at the Old Coach Road gate. Overnight travellers can camp along the way at Bungleboori in Newnes State Forest.